Bumper Cars is a 1987 roll-and-move family board game from Parker Brothers which is a remake and re-theme of the 1978 games Fribble! (English) and Sniggle! (French/Dutch). All of the games seem to be pretty much the same but Bumper Cars has an actual theme to it (bumper cars which actually makes quite a bit of sense based on the game’s mechanics). While not exactly the same, Bumper Cars also shares a lot in common with Parcheesi (which Eric reviewed this summer). The goal of the game is to be the first player to get all four of your bumper cars from their start spaces to their marked parking spaces at the top of the board. 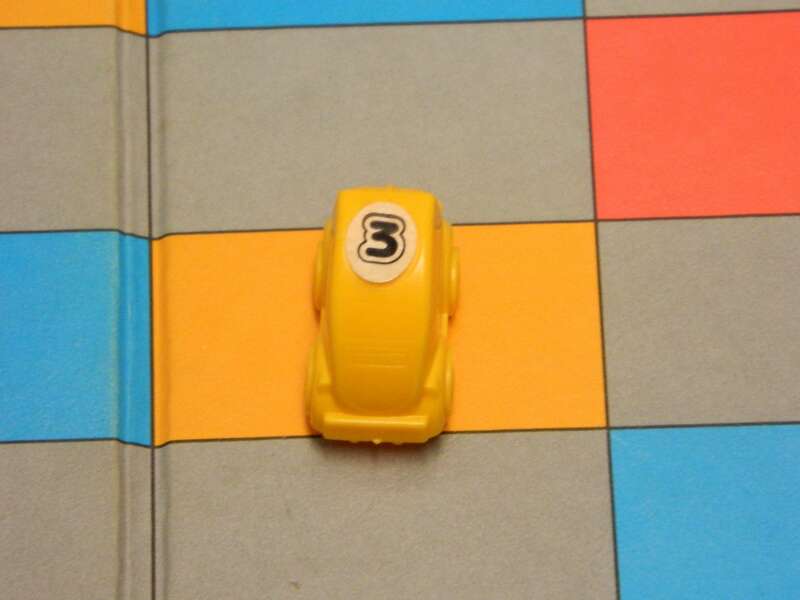 All players choose one of the four different car colors and place each of their numbered cars in the correct start spaces (the green #2 car would go in the green 2 space, etc.). Then, all players roll the dice to determine which player will start (highest number goes first). That’s it. Each turn starts with the current player rolling both dice. They then get the chance to move their cars according to the following rules. 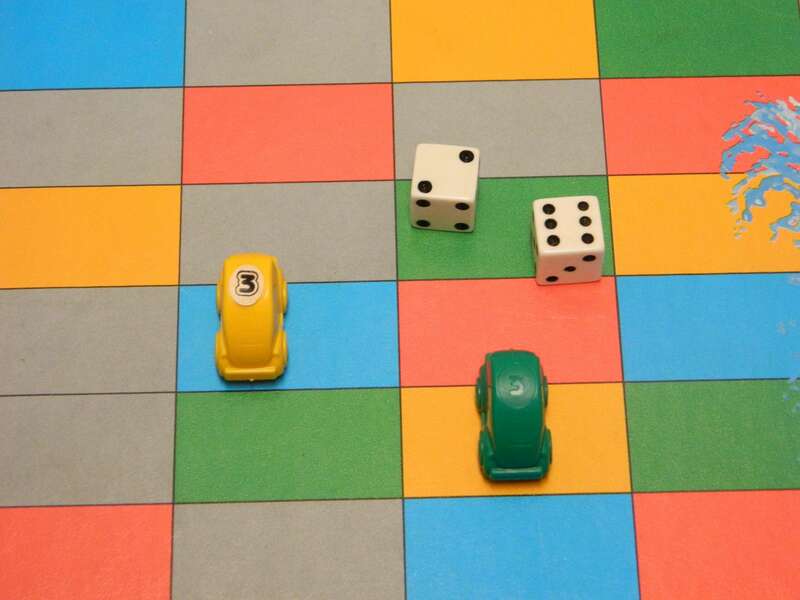 They must move two different cars (one must move the exact amount of the first dice and another must move the amount on the second dice). You can’t combine the two dice together and move one car that amount, the two dice always have to be used separately by different cars. Also, whenever you can move two cars, you must do so even if it puts one of your cars in danger (there are some situations where you won’t be able to move two and in that case, you can move just one). In situations where you can only move one car, you can choose which die number you want to use. Finally, when you roll doubles you get to move with both dice and then get to take another turn. If you are lucky enough, you can get multiple free turns in a row and there are no limits to how many you can get. After a player has rolled the dice and moved their cars, play moves to the player to the left. This yellow car has moved onto a space of its own color so it is safe. Other cars cannot land on this space (until the yellow car moves) and the yellow car can’t be bumped back to start. Players may move their cars forwards and sideways but never backwards or diagonally. Also, they are not allowed to move back and forwards between two spaces or retrace their steps in any way (each space must be a new space that your car hasn’t been on during this turn). There are three different things that can happen when you have finished moving a car. You could land on a space of your same color, in which case that car is safe from being bumped back to start (no other player’s car can land on the space and send you back). The second possibility is that you could land on a gray space or another color that isn’t your own (in which case you can be bumped back to start if another player lands on that space). Finally, you could land on a space already occupied by another player’s car (however, if that car is on their safe color you can’t land there). In this case, you get to bump that car back to its start space. You can always pass through occupied spaces but you don’t get to bump a car back unless you land on them by exact count (and they aren’t on a safe spot). This green car has a choice. They can use either die but most likely they will use the two to either move up to the safe green spot or move up one and left one to bump the yellow car back to the start. The ultimate goal of Bumper Cars is to get all four of your cars into their matching parking space at the top of the board (aka the parking lot). To enter the parking lot, you must go through one of the two entry spaces in the middle of the board. 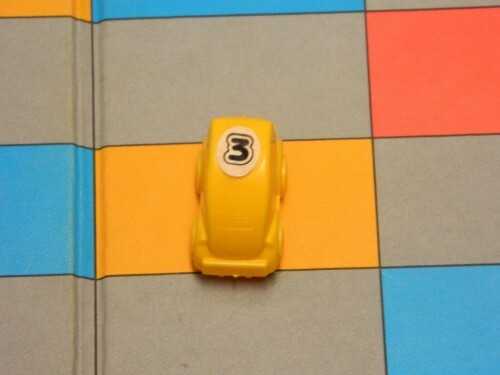 You can choose to take either path but usually you will want to pick the one that gets your car into its parking space quicker (unless you need to bump other players’ cars to catch up) so cars numbered three or four will probably go left and ones numbered one or two will likely go right. You may not reverse direction at any time (once you have chosen a path, you are committed to that path). You can pass other cars in the parking lot and you can also land on them and bump them back to the start (no spots in the parking lot are safe except for the actual parking spaces). To park one of your cars, you must land on the correct space (the spot which has your color and the number of the car you are trying to park) by exact count. As you can see, the parking lot can often times be complete madness and your cars will almost certainly be in danger at some point. To enter the parking lot, you must go through one of the two center spaces. To park one of your cars, you must land on its parking space by exact count. The first player to get all four of their cars into their matching parking spaces wins the game. The Bumper Cars rules include a shorter, easier variant where you only play with the cars numbered two and three and roll just one die each turn. Also, Board Game Geek has rules for an attacking variant which gives players more chances to attack their opponents (and “bumped” cars are actually removed from the game). I have not tested this variant but it actually sounds pretty fun. 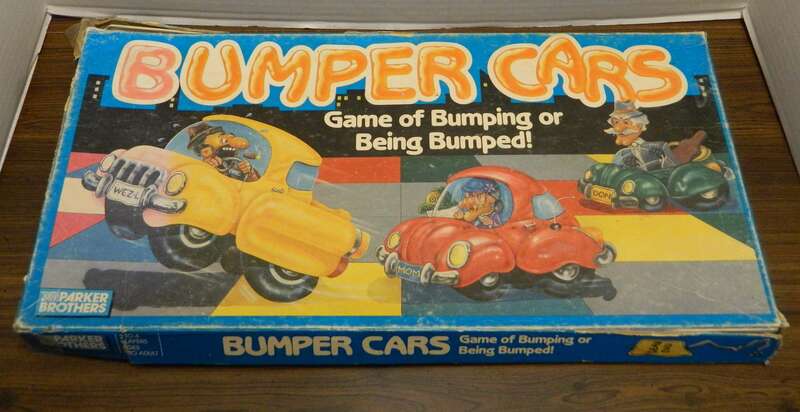 While Bumper Cars is definitely better than traditional roll-and-move games like Candy Land and Sorry!, I still wouldn’t exactly call it a good game. I like that the game adds a mess with your opponents mechanic (which also works as a catch-up mechanic) but it pretty much plays out the same way as Parcheesi, which was created hundreds if not even more than a thousand years before Bumper Cars (which gives it the tie-breaker). On the positive side, Bumper Cars is very easy to learn and play. The rules are simple and easy to follow and children as young as six should be able to play with no problem. Also, Bumper Cars does at least offer a bit more strategy and tactical thinking than the average roll-and-move. While there is still a ton of luck to the game (while you can almost always keep your cars safe in the early game you will eventually have to put them in danger once they enter the parking lot), strategic play can at least give you a small edge. Bumping adds some spice to the game and also works as a nice catch-up mechanic. Other than that though, most of my other thoughts on Bumper Cars are pretty negative. I like the idea of doubles giving you an extra turn but in some situations this can be unexpectedly overpowered. If you get doubles when you are in or near the parking lot, you can get your cars pretty far into the parking lot and into relatively safe locations without having to worry about them being bumped. Once your car is near its parking space, there aren’t a lot of cars that can bump you back to the start (since you will already be past a lot of the cars’ parking spaces (and usually players will focus on getting their bumper cars into their parking spaces instead of bumping other players back to start). While Bumper Cars is pretty good for families there is one potential problem with the game. While I like the bumping mechanic, if your kid(s) are really competitive and hate losing it could definitely lead to some problems. Most children will probably enjoy bumping other players’ cars back to the start but they might not take their cars being bumped back very well. Finally, while Bumper Cars at least has a theme (unlike its predecessors Fribble! and Sniggle! ), the game is designed in a pretty boring way. The plastic cars are alright but the board is boring and the dice are simply standard dice. I wish the theme (which makes a lot of sense for a roll-and-move game with a bumping mechanic) would have been implemented a bit better. 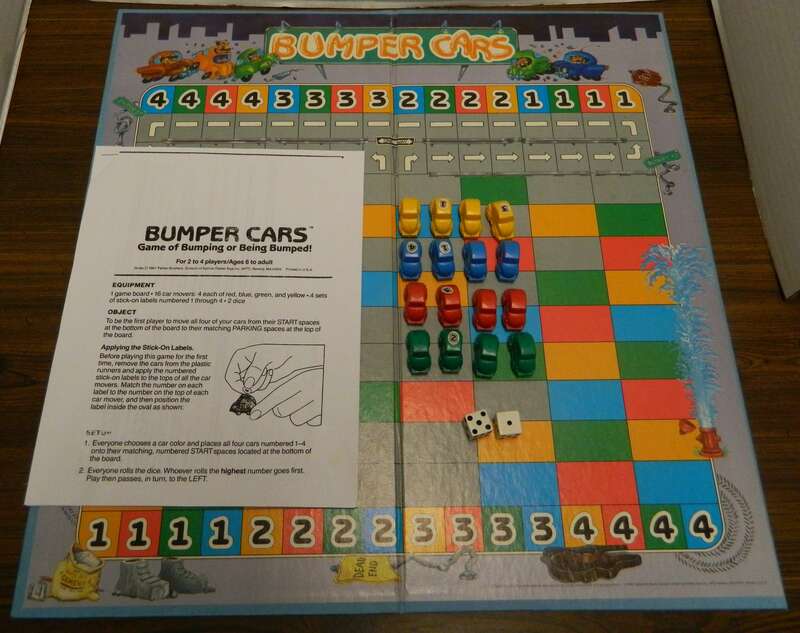 Bumper Cars isn’t terrible if you are looking for an easy to play roll-and-move game to play with your children that is better than traditional games like Candy Land and Sorry! If that describes your situation well and you find a copy at a thrift store or rummage sale for a dollar or two, I could definitely see it being worth a pick up (even though I think Parcheesi is a slightly better game). However, all other gamers should probably pass. I would give this game a 5 out of 5 star review. I played it as a kid. My siblings and I loved it, and I’d love to buy it for my kids. It was super fun. 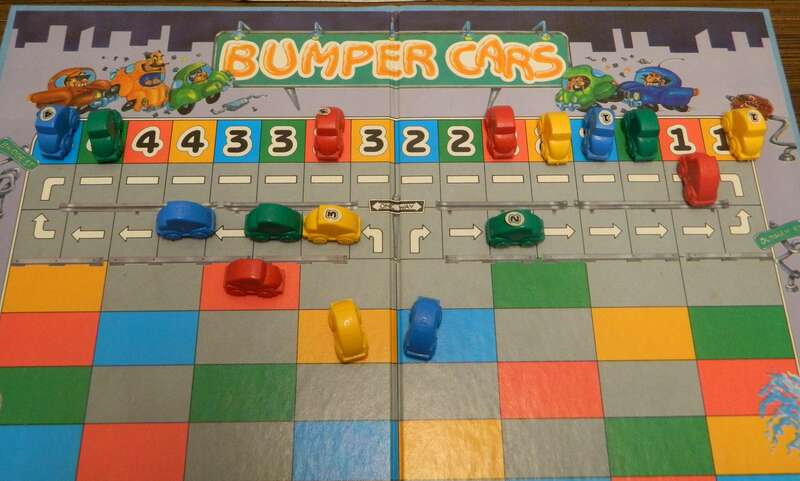 It's a roll-and-move game with at least some strategy (bumping other players and trying to keep your cars safe). Very easy to learn and play. Kids who don't take losing very well might not deal with the bumping mechanic very well. While better than games like Sorry! and Candy Land, it is still a below average game.